In the past few years i have seen many Developers asking the question that “how they can send sms using JAVA/PHP/C#/Python and any other language ?“. I n the past i developed API for sending sms using some free API’s like way2sms, but that’s not the case anymore because they made it more secure. So i decided to find out the alternatives and i got a few ways which can help you but these solutions depends on your exact requirements. Let me ask you few questions first. Are you a student and working on Project ? Are a Professional developer and working on some startup project ? Are you working on a company Projects ? I asked these question because each of them have a different solutions. This is easy but the only limitation imposes here is you have to verify each number on providers site, which will definitely work for a student because they need is this just for testing project and demoing their projects in the exam. if you are a professional developer or working for any company then you can afford to pay a very small amount for testing or deployment purpose. 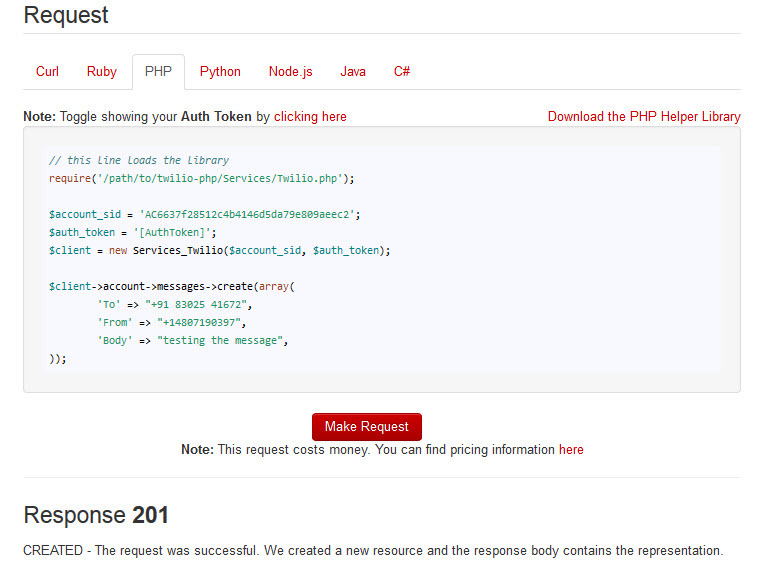 you can choose either the Paid version of twilio and follow the same process or you can use any other alternative provider’s API. All the provider mostly use direct URL based API’s where you have to send some authentication code along with sms details and it goes pretty easy . you can achieve that Using CURL. Please Share it, if you found this post helpful in your development process.